Towards the end of the Middle Ages there was what one may describe as a Neo-Augustinian renaissance which included a number of outstanding theologians such as Gregory of Rimini. This increased interest in Augustine’s writings to a large extent set the table for the Protestant Reformation, specifically with regard to the doctrine of predestination. Johann von Staupitz (c. 1460-1524) was Vicar-General of the Augustinian Order in Germany and a very influential mentor of the young monk Martin Luther. 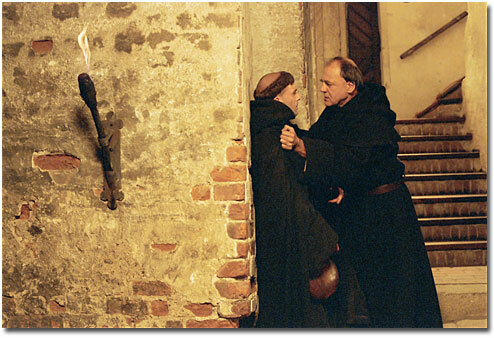 Von Staupitz, however, later had to release Luther from the Augustinian Order (perhaps you’ve seen the 2003 film Luther – I remember the scene where Luther is released by Von Staupitz distinctly – see picture below) to preserve the good name of the Order with Rome. 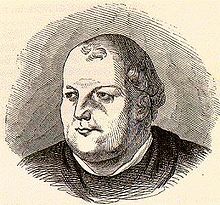 Though Von Staupitz never joined the Reformation and remained a Catholic both in disposition as well as in doctrine in a number of areas, he nonetheless still adhered to a number of Protestant-leaning doctrines, one of which was his view of predestination. He came to be associated with the “Lutheran heretics” as a result of it, and in 1559 Pope Paul IV put Von Staupitz’s works on the Index of Prohibited Books. “In order that the whole plan of creation should not be frustrated, there has been ordained preservation by divine power for nature and for free will the grace of the divine Incarnation; and thus natural life is upheld by preservation, a morally good life is sustained by grace, and both by God Himself. Accordingly, before the creation of the world it was determined that no one would be able to do morally good works without the grace of Christ. Because mercy and justice contribute equally to the praise of the Almighty it has been decreed that some should be elected and predestined to conformation with the image of the Son of God and to faith in our Lord Jesus Christ. But those who do not have faith are judged already. This [election] is the first grace which precedes nature and works. No one elicits or merits this grace, nor is this grace due to merits foreknown by God, nor to good use of reason in the future foreseen by God, nor to merits already performed. Rather, the sole source of this grace is the most kind and generous will of God. Paul, illustrious doctor of the Church, tongue of Christ, and the most direct disciple of the most Holy Trinity said: ‘Those whom He predestined He Himself also called.’ He did not say, ‘He had them called,’ Many are called by the ‘light that has arisen over us,’ others by the law, by prophets, by gifts, by tribulations, by Apostles or preachers of the faith. But not all are elected. However, those who are freely predestined are called without fail in their lifetime unto faith by God’s powerful will. For indeed this is not done by Moses nor by the prophets nor by the Apostles, but by God Himself Who speaks to the heart. Concerning this call the Son said, ‘No one comes to Me unless the Heavenly Father draws him,’ Paul also preached this in an excellent manner: ‘I planted, Apollos watered, but God gave the growth.’ For indeed he who plants is nothing, nor he who waters, but He who gives the growth, that is God, is all.